Purchase online ACS712 Current Sensor Max 2Amp in India at low price from DNA Technology, Nashik. The Allegro™ ACS712 provides economical and precise solutions for AC or DC current sensing in industrial, commercial,and communications systems. The device package allows for easy implementation by the customer. Typical applications include motor control, load detection and management, switch mode power supplies, and over current fault protection. The device is not intended for automotive applications. The device consists of a precise, low-offset, linear Hall circuit with a copper conduction path located near the surface of the die. Applied current flowing through this copper conduction path generates a magnetic field which the Hall IC converts into a proportional voltage. Device accuracy is optimized through the close proximity of the magnetic signal to the Hall transducer. A precise, proportional voltage is provided by the low-offset,chopper-stabilized BiCMOS Hall IC, which is programmed for accuracy after packaging. Allegro ACS712 current Sensor device which provides an economical and precise way of sensing AC and DC currents based on Hall-effect. This is a breakout board for the fully integrated Hall Effect based linear ACS712 current sensor. 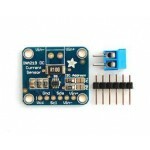 The sensor gives precise current measurement for both AC and DC signals. Thick copper conductor and signal traces allows for survival of the device up to 5 times over current conditions.Compatible with arduino and since its output is analog it can be directly interfaced to PIC controllers, AVR & ARM processors as well. The ACS712 outputs an analog voltage output signal that varies linearly with sensed current. The device requires 5 Volt DC for VCC and a couple of filter capacitors. Please keep in mind that though the ACS712 is rated for 2.1kV isolation, the PCB it is on is not designed for that type of voltage. Please keep that in mind if you are using this breakout in high voltage applications. INA219 Current Sensor ModuleThis INA219 breakout board will solve all your power-monitoring problems..